The photo above is an example of what you’ll be able to do with these techniques. The flowers in the photo are Blue Lechenaultia. This image shows the detail and depth of field (DOF) we can get with these techniques. It was shot at f/32 and 1/200 with flash. 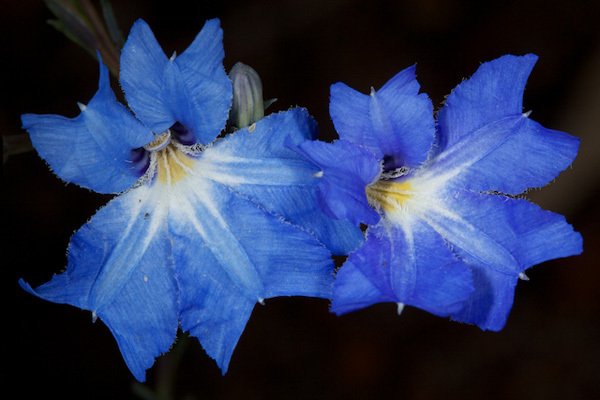 This method of photographing wildflowers shares the same objectives as the method described in Steve’s book, but achieves them by a different route. We want photos that reflect the beauty of the flower in its natural state, while eliminating any distracting background clutter. Why use a close-up flash? We need to get a flower subject to fill our frame to get as many useful pixels as possible recorded. When we photograph at high magnification (say 0.2 to 1.0), the depth of field becomes very small and we end up with part of the subject in focus and the rest a blur. The way to overcome this is to shoot with a small aperture. I use f/32 for the closest subjects and a bit wider for subjects further away. To get enough light into the lens under these conditions, you need to illuminate the subject with flash. The ETTL process will calculate the exposure, and the ambient light will play no part at all. Single Lens Reflex (SLR) Camera. I have used this technique with film and digital SLRs, and even with a medium-format Mamiya camera. Compact “point and shoot” cameras usually don’t have small enough aperture settings. Macro Lens. A macro lens is different from the “macro” setting on a zoom lens in that it provides up to lifesize magnification (also known as 1.0x). That means the image on the sensor or film is the same size as the subject. That’s the sort of magnification you need. Personally, I use the Canon 100mm macro lens. Flash. Now what sort of flash? The key is to have enough power–more is better. Any regular flashgun with ETTL used with an off-camera cord will do the job, as it has far more power than a macro flash, but it’s a bit hard to handle. 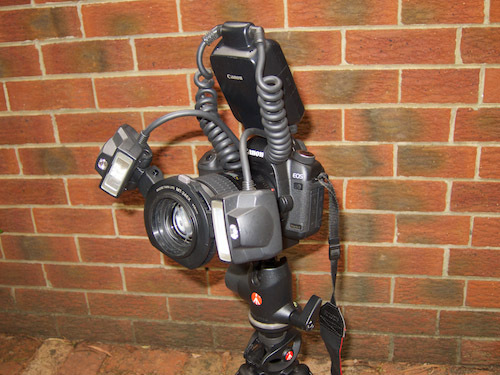 My choice was the Canon M24 EX macro flash, which has two little flash heads mounted on the front of the lens. When choosing my flash, I suspected that the ring flash would not have enough power, although I have never tried one. If you do not have enough flash power, you will have to compensate by opening up the aperture. The M24 has the advantage of some separation distance between the flash heads, and the ability to set one brighter than the other. This helps avoid both too much “flatness” in the image, and harsh shadows. Compose and focus. If your autofocus has problems, you may need to turn it off and get a sharp focus by moving the camera towards and away from the subject. Fire a metering flash, choosing a light part of the subject. For the Lechenaultia shot above, I did the metering flash on the white part of the flower. When you use flash for a small subject, you almost always need to fire a metering flash, and it should be centred on the part of the subject that is closest to the flash or lightest in colour. This will give correct exposure. Otherwise, your unit will flash its little heart out trying to illuminate the far corners of the universe and your subject will be overexposed. Remember that you are maximizing depth of field. So, crossing stems and other distractions that do not show up in the viewfinder with the lens wide open, will come out sharply when the lens stops down and if they’re within range of the flash. Sometimes it’s necessary to push some of them aside to get a clean image. For larger subjects, you will have to get farther back and the flash will have to project farther. After you do the metering flash, your camera will tell you if your aperture is too small. Macro flashes are pretty weak, so it may be necessary to open the aperture a bit to compensate. This is not a big problem because, as you get further away from the subject, you do not need such a radically small aperture as depth of field naturally increases too. And here is the result, complete with crossing stems! I guess not every shot can be a winner. 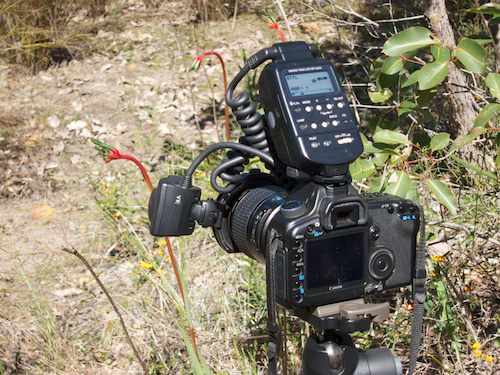 Many wildflowers grow pretty close to the ground, so a tripod can be both inconvenient and unnecessary for shooting them with this method. If you have your elbows on the ground, your camera is firmly enough supported. The same applies if you sit on the ground with your elbows on your knees. Composing and focusing is easier without a tripod. Steve has emphasized the need to get down (and often, dirty) and look the subject in the face. He is right. For subjects above sitting height, a tripod is a big help. It is too easy for the shot to go out of focus if you are handholding the camera while standing or kneeling. Sometimes with this method you don’t always get a dark enough background, so try raising the black point with a Levels adjustment to further suppress the background. All the flowers I photograph are growing in their natural location. None have been picked or relocated. It’s important to leave no trace while photographing wildflowers so others can enjoy them, and so they can return again next year! In conclusion, I think this little cutie, Rusty Spider Orchid, Caladenia ferruginea illustrates the benefits of the method.. 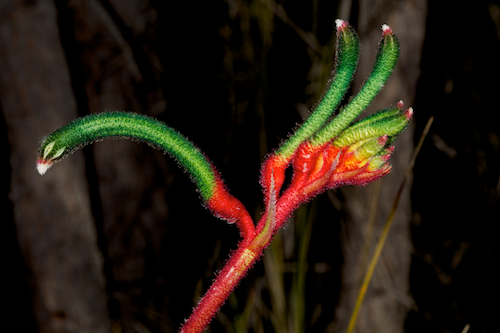 If you like these shots, take a look at some more at my Western Australian Wildflowers Lightbox. 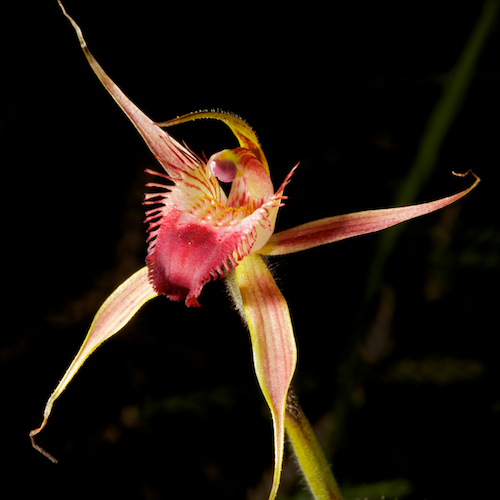 Another good link is WANOSCG, horrible acronym, but great people and pictures, and the authority on wild orchids. About the Author: Rob Neave lives in Perth, Western Australia. A keen photographer, he has specialised in imaging the local wildflowers for many years. He has many publication credits both for flower close-ups and for scenic shots. Rob has now retired from a career as an engineer building power stations, to spend more time on grand-parenting and photography. Great article, well written. I do my shots with a wireless flash and all hand held, no tripod. You can view some of my shots at the link below. Great article. I have an almost identical setup though I mostly use a 180 macro. I do find the black backgrounds a bit samey when using flash and want to experiment with some off camera flashheads to illuminate the background a little. Nice tutorial. One question/observation though. You said that the P&S won’t work because they don’t have “small enough aperture settings.” Presumably by that you mean they don’t have great enough DOF. It’s my understanding, I believe from reading Bryan Peterson’s Understanding Exposure, that the aperture settings on P&S cameras don’t provide the same DOF as on SLRs. That is, because of the very small sensors, DOF on P&S cameras is greater at a given aperture than an SLR. I don’t remember the equivalences, but it was something like f/8 on a P&S is like f/22 on an SLR. This is one reason it’s so hard to get the nice background blur for portraits with an P&S, even at f/2.8. (Also, I think there is also a DOF difference for APS-C sensors for FF sensors – the FF sensor giving “better bokeh” because they are larger and have shallower DOF at a given aperture than APS-C.
Duluk: You are right in that a smaller sensor will give you are relatively larger depth of field for a given apeture, though I’m not sure what the actual conversion would be. I have heard the 1.5x difference between APS-C and full frame does make a difference, David Ziser talks about f/4 APS-C = f/5.6 FF if that helps. It is also worth noting that at any aperture over about f/11 on and APS-C camera (or a bit more on a full frame or even more on a MF) you will start loosing sharpness due to diffraction, therefore you need to weigh up the benifits of increasing DOF Vs overall sharpness. Interesting article! I have moved away from flash photography for flowers mainly because of the contrast between flower and background. I used the same setup as the author I usually add diffusers to my two twin flashes to soften the light effect on the flowers. I have also used the flashes set to lower power, so that they act more as fill in flash. This allows more background to come into play. Often if I have to take a flower using flash I will look for a bigger leaf I can place behind the flower in order to break the black background. This also allows the flashes to use less power as there is more reflection back into the camera via the background. Something aside, I find it amusing how everyone regards their area as the centre of the worlds wildflowers. Can we not accept that each area has it’s own uniqueness and enjoy it and through our photography share it with the rest of the world. What is pleasing is to discover that there are obviously as passionate Botanical photographers out there as I am. Sometimes I wonder if I may have some sort of disease, as my wife often says no matter where you find yourself Kirk will find a flower somewhere. Duluk: I really should do some actual real world tests on this, I have noted that some of my older photos taken and quite small apertures are softer than expected but never done a direct comparison. However it’s worth having a quick look at the resolution chart on this page for the Canon 100mm macro as it shows how resolution changes between f/2.8 and f/22. Very interesting post with some good advice. I specialise in commercial, event and architectural photography but really need to start adding nature photography to my services. I’ll be trying out some of your recommendations later. I’m not really a fan of flash but I can see that it has it’s use in this area. I would like to clarify the issue of DOF related to format size. For close-up work, depth of field is independent of focal length. It is dependent on magnification, F-number, and the size of the circle of confusion. Circle of confusion is a means of quantifying the essentially subjective assessment of how sharp is sharp enough. Wiki gives a derivation and table of values. The value is different for each format size. For close-ups, DOF = 2cF(m+1)/m^2. Remember, F(m+1) is the effective aperture for close-ups. So, for the same level of magnification the DOF is less for a smaller format. However, a smaller format needs less magnification to fill the screen, and when you make the correction, DOF comes out greater for APS than for 35mm. Even though c has been reduced for the smaller format tending to reduce DOF, the reduced m^2 on the bottom line has a greater effect and the DOF is increased. I have done an excel model of this but can not post it. Now, for the issue of P&S cameras having better DOF, this may be true at normal shooting distances, (not close-up), because their focal lengths are so small. And we all know that a shorter focal length gives better DOF (but not for close-ups). Wikipedia covers these issues with a long, rambling academic paper, which gives much information, some of which is useful. So if you want to check what I have written, that is where to go. I like to understand these theoretical issues, but doing so does not affect matters much when I am flat on the ground trying to hold the camera still with flies walking round my eyes and ticks looking for a way into my clothing. More theory – Diffraction, how much does it matter. Diffraction causes a geometrical point in the real world to be imaged as a circular spot. This is called an Airy Disk. The smaller the airy disk, the sharper the image. The diameter of the airy spot, d = 1.22 x wavelength of light x aperture F number. It seems logical that if the Airy Disk is no greater than the size of a single pixel size on the sensor, then diffraction can not be an issue for image quality. I have made a chart which shows how this works and compares pixel size of some cameras. Can not post it, but will send to anyone who asks. It is also the case that diffraction is not an issue for somewhat larger airy spots if the lens is in any way less than perfect or the focus is less than perfect. So the practical question is “How much does diffraction matter?”. To address this I fired off 2 test shots in my garden. The first at F8 which will give the best DoF consistent with approximately-zero diffraction effects. The second was at F32, giving the best DoF regardless of diffraction effects. Conclusion: The F32 shot was far superior because of its better DOF. Lack of DoF is a worse problem than diffraction within the range of F-numbers available to me. Great article. Very interesting indeed. I have used a Lumix FZ1000 with so-called 1 inch sensor on macro zoom for orchids, and also an Olympus OMD-em1 with 300mm lens and 1.4x convertor. both as close as I can get them on orchids…without flash. The Lumix has greater DOF than the Olympus system. But the Olympus bokeh is really nice. 1.4m is the closest focusing distance for the Olympus system. But only 2cm for the lumix on macro zoom.